The Prince of Wales has laid a wreath on behalf of the nation at a remembrance service at York Minster as 4th Mechanized Brigade (4 Mech Bde) honoured the 72 Service personnel who died on recent deployments to Afghanistan. 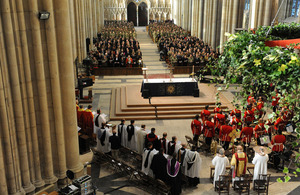 On Monday 6 December 2010 around 600 military personnel, dignitaries and relatives of those who have died packed York Minster for a service of memorial and thanksgiving. 4 Mech Bde returned from a six-month tour of Helmand in October 2010. Prior to the service, Brigadier Richard Felton, the Commanding Officer of 4 Mech Bde, reflected on his time in charge of Task Force Helmand from April to October 2010. Also attending the service were Defence Secretary Dr Liam Fox, Chief of the General Staff, General Sir Peter Wall, and military representatives of other nations serving alongside the British in Afghanistan. As the names of 72 soldiers, Royal Marines and other personnel were read out, the Minster’s bell tolled. Popular tenor Russell Watson and soprano Hayley Westenra both performed during the service. More than 150 relatives of injured or deceased Service personnel were among the congregation. After the service they were hosted at Imphal Barracks in Fulford, York, along with the Prince and other guests. 4 Mech Bde was 6,500-strong for its deployment as Task Force Helmand. The duties of the Brigade, most of which is based at Catterick Garrison, included supporting the Afghan Government during the country’s elections, training and mentoring its security forces, and laying the foundations for a more stable future. Among the guests was Brigadier Mike Griffiths, Colonel of The Duke of Lancaster’s Regiment, who lost his son during the tour; Captain Andrew Griffiths, aged 25, of 2nd Battalion The Duke of Lancaster’s Regiment, died from his injuries after being caught in an explosion. I think it is hugely important to remember and recognise the sacrifice of all those who died during the tour. I’m here as a father who lost his son. My regiment lost six soldiers, he was one of the six.